Raimund Harmstorf was born October 7, 1930 in Hamburg, Germany. His father was a surgeon in Hamburg and Raimund was a sports star specializing in the decathlon. He went to college and studied medicine, music and the performing arts. Harmstorf then appeared in small TV roles in the late 1960s and became very popular, especially with the ladies, after his TV appearance in Jack London's “Sea-Wolf” (1971). He then appeared in several German western productions such as “Call of the Wild” (1972) with Charlton Heston, “Cry of the Black Wolves” (1972) with Ron Ely, “White Fang” (1973) and “Challenge to White Fang” (1974) both with Franco Nero. Raimund was then offered several roles in German, Italian co-produced westerns such as “The Genius” (1975) with Terence Hill and “California” (1977) with Giuliana Gemma. These were followed up with appearances in the last modern day westerns of the genre “”Thunder Warrior” (1983) and “Thunder Warrior II” (1984) with Mark Gregory and “Manhunt” (1984) with Ethan Wayne. 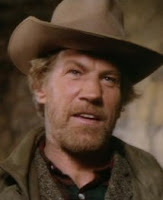 His final Euro-western appearance was in the made for TV serial “Alaska Kid” in 1991. Late in his career he was involved in several injuries and accidents. His restaurant “Sea Wolf” went bankrupt and he developed Parkinson’s disease in the late '90s. The press began to print stories about his illness and that he was seeking psychiatric help. Harmstorf was overwhelmed with these problems and committed suicide by hanging himself on May 3, 1998 in Marktoberdorf in Bavaria, Germany. The police blamed the tabloids for partial responsibility in his death. Today we remember Raimund Harmstorf on what would have been his 80th birthday. Not a western, of course, but I will always associate him with the classic Euro-crime title Bloody Friday, aka Violent Offender.